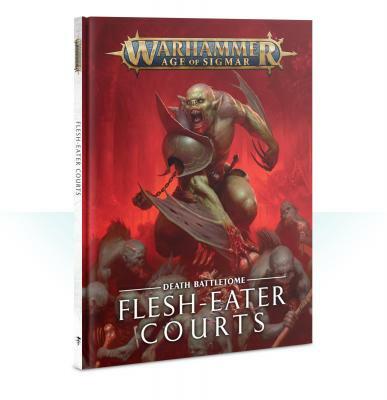 In this 88-page hardback battletome, you’ll learn the history of the Flesh-eater Courts in the Mortal Realms, from their long-lost origins as noble courts, through to their hard-fought battles in the Soul Wars, all illustrated with dark and sumptuous art. You’ll discover how their strange society operates – a vile pastiche of mannered courtly life with a distinctly macabre twist. The battletome goes on to cover just how the Flesh-eater Courts go to war, showcased by several themed warscroll battalions and all the warscrolls needed to field an army of cannibals on the tabletop – from the serried, scrabbling ranks of the Crypt Ghouls to towering monstrosities like the Royal Zombie Dragon. You’ll be able to customise your Flesh-eater Courts army with a host of allegiance abilities, including rules for different Grand Courts, which allow you to dedicate your mordants to one of the legendary Flesh-eater Court kingdoms. Battletome: Flesh-eater Courts lets you customise your champions with a selection of sinister artefacts, as well as a blood-drenched spell lore that allows you to enhance the dark strength of your units. The included Path to Glory rules and bespoke missions are perfect for learning your army’s rules, while for collectors, a showcase of beautifully painted miniatures, alternative colour schemes and painting tips are fantastic for inspiring your own army. This book contains: - 13 warscrolls, 3 Endless Spell warscrolls and a warscroll for the Charnel Throne terrain piece. - 9 warscroll battalions that reward themed armies with special rules - The Lore of Madness – a special set of spells for Flesh-eater Courts Wizards - Background, allegiance abilities, command traits and artefacts of power for each of the following Grand Courts: Morgaunt, Hollowmourne, Blisterskin, and Gristlegore - A gallery of beautifully painted Citadel miniatures to inspire your own work - Pitched Battle profiles for all units If you’re looking to conquer the Mortal Realms with dark magic, sinister tricks and savage force, this is the army for you!